Your AR15 becomes more powerful ammunition with the right weapon accessory. How do you make it the best piece in your arsenal collection? The best EOTechs for AR15 boost your rifle with electro-optic accessories. Which one is the ideal product for your choice of firearm? The 512 model is one of the best EOTechs for AR15. This is the most popular in the collection of holographic weapon sight. The rifle accessory is ideal whether for defense, law enforcement, hunting, and recreational shooting. One of the best features of Model 512 is the ease of installing or setting up the piece on your rifle. A lot of users commend the product for a boost in speed, acquisition, and control with this type of upgrade. The tactical holographic optics accessory holds a remarkable track record based on the positive reviews of actual users. On top of its fine optics, Model 512 also received accolades for its capability to last up to 1000 hours powered by two 1.5 V AA batteries. This is a superior piece with its water resistant features, submersible to 3 meters or 10 feet depth. The 326g weight optics is quite lightweight for your AR15 rifle with a versatile, ready-to-mount feature. 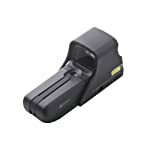 Model 512 does not have night sight compatibility feature which is an obvious setback for the accessory. Moreover, it is specifically designed for close quarters which may limit the locations where you can use your rifle with desired efficiency. Overall, Model 512 is still the leading choice for holographic weapon sights for AR15 rifles. It offers good value for your money. You can choose between a camo and black model or get both to complete your collection. The EOTech model is dubbed as the smallest, lightest, and shortest in the holographic weapon sight collection by far. It is definitely handy, portable, and lightweight with a relatively smaller size dimension. The 255g weight of the AR15 rifle is also water resistant and submersible to up to 10 feet or 3 meters. A lot of EOTech users applaud the XPS2 model simply because of its compact and easy to install feature. It is convenient for law enforcement officers and hunters or target shooter to carry. The single 123 lithium battery basically powers up this holographic weapon sights model. It is the ideal rifle accessory you are looking for if you want more rail space for your magnifiers or rear iron sights. Even for its size, the XPS2 model is heavy-duty and long-lasting. The smaller sized battery could actually last for 600 continuous hours at room temperature and nominal setting. The letdown of this model is that it does not have any night vision compatibility. It is also much pricier compared to its Model 512 counterpart. According to the suggested manufacturer retail price, this holographic weapon sight is quite expensive due to its powerful yet compact design. Overall, the XPS 2 model is still a remarkable choice especially if you want something smaller and lighter for your AR15 rifle. Even with a much smaller size, the battery life is quite impressive compared to other weapon accessories in the same category. Now here’s a treat for those who prefer a holographic weapon sight with night vision compatibility. The 552 model is basically the best EOTech for AR15 with the most affordable price tag for accessories in its category. You can also partner this with most devices that have night vision features. Use this 250g optics to boost your speed and accuracy even when everything around you turns dark. The waterproof and submersible unit can last up to 33 feet or 10 meters in depth. The easy to install rifle accessory is fog-proof with internal optics to maintain fine vision regardless of the outdoor condition. Your activities can get as tough as possible but this weapon sight still offers a reliable function for clear shot and vision. 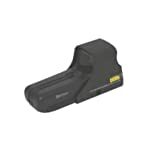 The product is one of the top of the line models in the EOTech series. However, there are some issues with its battery function due to improper battery storage. Moreover, it is quite costly compared to other night vision sights in the same category. Overall, Model 552 is a good addition to your arsenal accessory collection. The holographic weapon sight is a good pick if you are looking for a night vision feature. Checking the positive reviews regarding the product, it is a strongly recommended choice for users in different experience levels. Equip your AR15 with the best holographic weapon sights that offer high-quality features for all types of environment. EOTech is one of the leading and most trusted brands of weapon accessories that are used for military, law enforcement, target shooting hunting, and recreational shooting. Materials and Features. 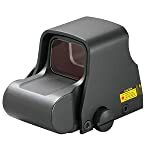 Holographic sights must be made from top quality and formidable materials such as shock-absorbent resin. You also need to look into the different features of your AR15 accessory. Some units have chronograph mounted designs while others are fully equipped with bipod for AR15. Materials and features of the holographic weapon sights usually determine their level of performance. The construction also influences how long the weapon accessory would last and could withstand heavy-duty use. Size and Portability. Choose an optic accessory that is lightweight and compact to match your AR15. This particular feature also makes your arsenal easy to carry during combat and target shooting. Make sure your holographic optic’s battery is longer lasting even with a smaller and much lighter unit. Heavy Duty and Durable. Holographic sights for AR15 are designed for heavy-duty use that withstands minor and major impacts. High-quality optics with durable construction maintains their stability even with rapid or repeated rifle firing. Battery Life. The best holographic weapon sights must have long-lasting battery life for hours and hours of combat or target shooting. Your optics must remain functional and powered in nominal settings and temperature. The best EOTechs for AR15 depends on your needs and preference of use. Read about online reviews of today’s holographic weapon sights from the most trusted brand. Choose the right optics accessory to boost your performance today!